Elva. Triangular. Green & White Stickers. 3" Pair. 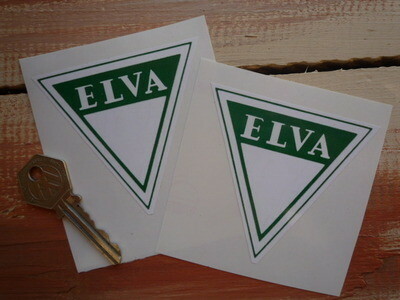 A pair of Green & White, Elva stickers. Each sticker measures approximately 80mm x 75mm at it's widest points. Donald Healey Motor Company Austin Healey Style Sticker. 3" or 4". Elva Self Adhesive Car Badge. 2". AC Cobra Style Laser Cut Self Adhesive Car Badge. 1.75"
Chevron Cars Badge Style Stickers. 4" Pair. TVR Black to Edge style Wheel Centre Stickers. Set of 4. 47mm, 58mm or 60mm. TVR Black & Silver Coachline Style Wheel Centre Stickers. Set of 4. Various Sizes. Cars & Car Conversions Chequered Stickers. 6.25" Pair. AC Cobra 50th Anniversary. Flag & Scroll Sticker. 3.75". 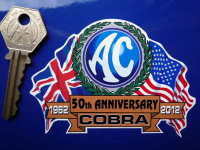 Cobra Shelby Snake Style Laser Cut Self Adhesive Car Badges. 2" Handed Pair. AC Cobra Wheel Centre Stickers. Set of 4. 50mm. Castrol & BMW Euro Touring Car Champions 1973 Sticker. 4.75". TVR Striped Text Shaped Stickers. 4" or 6" Pair. TVR Solid Black Circular Stickers. 3.5" Pair. AC Cars Wheel Centre Stickers. Set of 4. 50mm or 60mm. 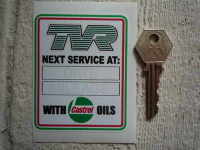 TVR Service with Castrol Oils Sticker. 3.25"
AC Cars Garland Style Laser Cut Self Adhesive Car Badge. 2"
Cars & Car Conversions Cut To Shape Sticker. 8".